We are now committed, even if not fully equipped for this trip. 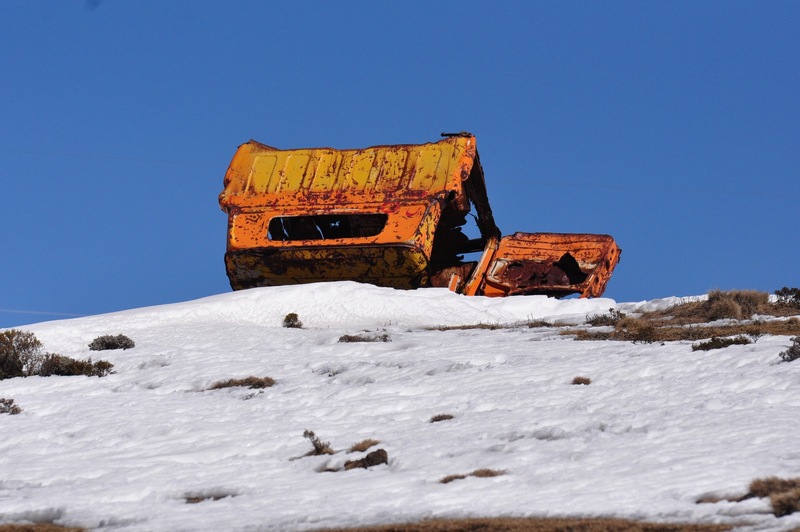 Our rusty pickup truck is no longer climbing towards the Sani Pass, our exit from Lesotho to South Africa. It is descending. Even if Sani Pass is the highest pass in South Africa at almost three kilometers, it is still at a lower altitude than the highlands of Lesotho. The truck has big wheels and lot of room for passing over rocks. But it has no four wheel drive. We are going down muddy roads. Snowy roads. Steep roads. There is no turning back, this car would not be able to climb out. We hope that the rest of road is only going down, and that the border patrol on the Lesotho side is as lenient about letting two wheel driver vehicles pass. On the South African side they do check. After my earlier tours in India, this is going to be an interesting road. It is listed as one of the most dangerous roads in the world. And even if Rothang Pass in India was scary, it was nothing compared to Sani Pass. Rohtang Pass was still a road... this road is more like following a bulldozer track. Literally. The road is extremely steep. Perhaps in reality not as dangerous as Rohtang Pass, as there is very little traffic here. There is no real danger of going off the cliffs, as we have to drive so slow. Except when the car starts to slide in the mud and slippery rocks... but at the end of the day the grip is good, given that we are mostly driving through a boulder field. Too many rocks to go anywhere too fast. But we are not here for the road experience. 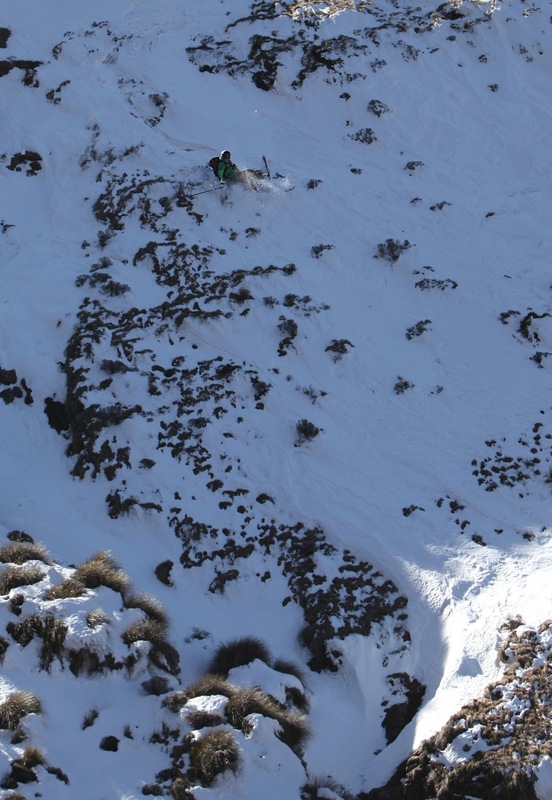 We are here to because it is a bad year to go skiing in South Africa. Earlier this year, South Africa's only ski area, Tiffendel, closed up business. Bankruptcy. If I want to collect South Africa as one of the places that I have skied in, it has to happen outside ski areas. And since we are at the highest road in South Africa and there's just a little bit of snow at the top part of the road, this is probably the only spot in the entire country to do that. And the spot is not looking particularly easy. There is very little information in the Internet about off-piste skiing in this area, but the one web page that we had seen marks the beginning of the road as the "scary bits". Indeed. And as mentioned, the road is steep. Steeper than anything I have ever seen, including Himalayas, Norway and the Alps. But while the road is making tight switchbacks, the skiing will be straight down. Literally, in some cases. I do not want to go off a cliff. Route finding is difficult, as we are here for the first time. We can't see what is behind the next curve, and given our vehicle we cannot return if go further to check. 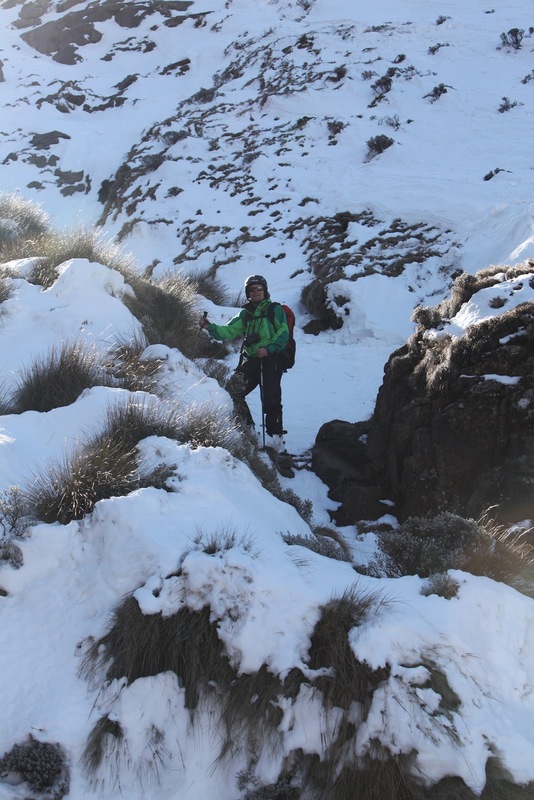 The start of the "ski run" at the top of Sani Pass, at 2900 meters. Its time to put the boots and skis on. And helmet. My ski run is short, under 100 meters in altitude difference. But I manage to fall three times. And get more scratches to my skis than I have gotten in the entire season so far. I would normally carry my skis over a pile of rocks, but in some places there was not enough space between the canyon walls and the road to break before hitting rocky ground. Oh well. Skis are made for skiing, not for preservation. I wish I had started from the very top, and not from the first turn, but we did not realize that early enough to stop the car right after Lesotho's border post. From the top I could have made some additional ski turns, as they are rare here. Most of my way further down is either narrow passages or steeps that I have to take very carefully. In the very end I get problems with finding a safe way down. I can see one way down that ends in side stepping and climbing on foot, having to take off my skis. Tero is watching from the road on the other side, and he suggests a different route, but its not easy for him to see how steep the other route is. I decide to opt for the safe but not so good alternative, skiing as far as I can and then take off my skis to climb down. Probably for the best, when we see the other way it would have been quite steep at the end. I have skied in South Africa! Part of the reason why I stop here and do not explore further or try to climb to the top is that we are in a hurry. It is half an hour before the border station on the South African side closes, and we might have to spend the night behind the gate if we don't make it. We are already in South African soil, but the actual border patrol station is further away, at the bottom of the Sani Pass road. I can understand that the police do not want to stay in this precarious spot. Deserted pieces of trucks on the road between Oxbow and Mohotlong. We start driving down the road. We are still high up, and the drive is challenging. The road is narrow and when we meet vehichles coming up its hard to find the right spot to pass. Particularly when our car refuses to go back even a centimeter. Luckily the other cars have four-wheel drive and they can find their way around us. I'm thankful that Tero is driving. 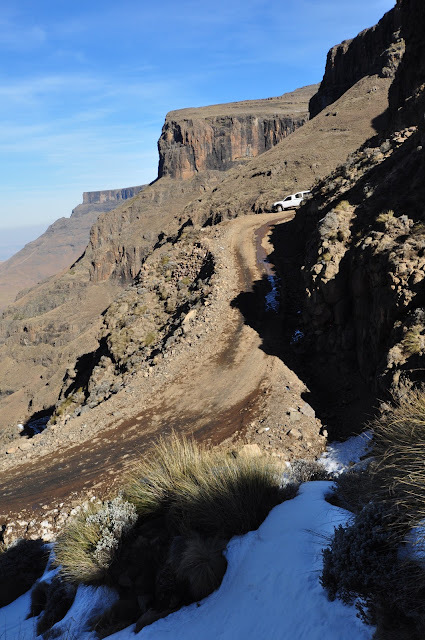 He has driven the whole road, and both the way up from the Lesotho side as well as here in Sani Pass is a real challenge. I've driven in weird places, but I'm not sure I would have survived this drive on my own. We reach the border station ten minutes before closing time. Twenty minutes later we see the first sign for accommodation, and after a ten hour stressful drive, the temptation of a luxury hotel (with heating!) is irresistible despite their incredible price of 90€ per person. We are at the Sani Pass Hotel, a large golf resort and we appear to their only guests. Oh well, they have a warm shower, Internet, and dinner is included in the price. If you golf, I can recommend this place. The surroundings are surely different from any other golf course, as the Sani Pass mountains are still towering around us. 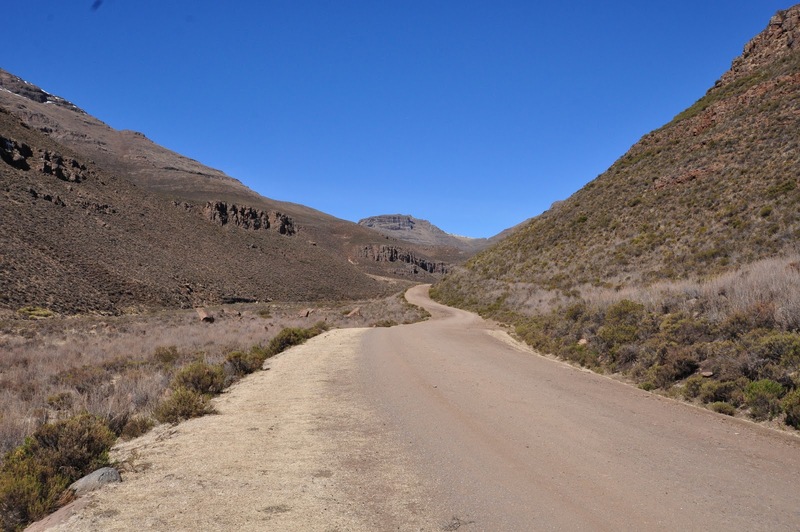 Road to Sani Pass, Lesotho. 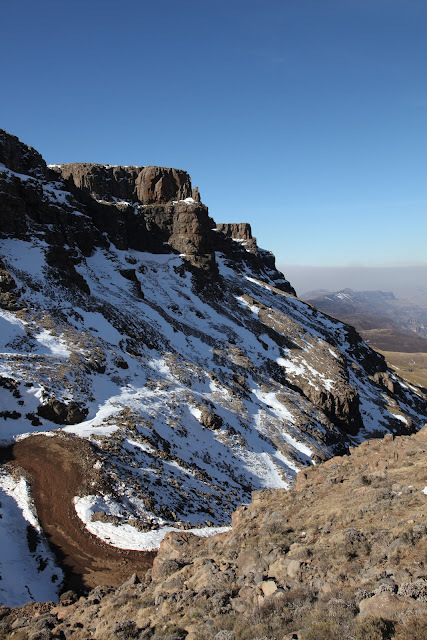 Sani Pass is also home to the highest peak south of Kilimanjaro, Thabana Ntlenyana. At 3482 meters, it would have been an attractive hiking destination. Another accommodation option for Sani Pass is to stay at the top in Sani Top Chalet. They organize guided tours to Thabana Ntlenyana, and the round-trip takes about 8-9 hours. If we had had more time, I would have tried that, possibly trying to take my skis with me. They also offer horseback tours to the mountain, which might have made it easier to drag the heavy ski equipment to the top and still make it back during the same day. 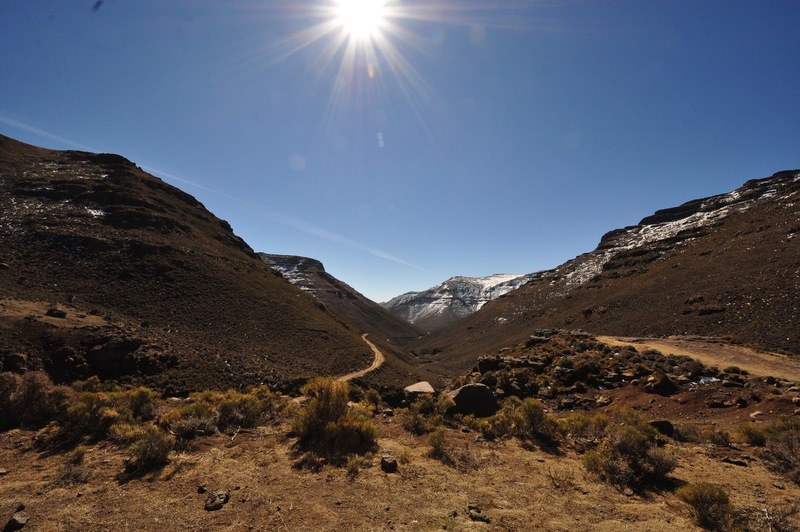 But staying at the bottom of Sani Pass definitely has its advantages. Electricity and other modern amenities are in short supply at the top, and I'm guessing heating would have been limited as well. In the Sani Pass Hotel we enjoy can the restaurant and the bar and all the other comforts. For comparison, soup of the day costs 32 Rand (3.2€) here. 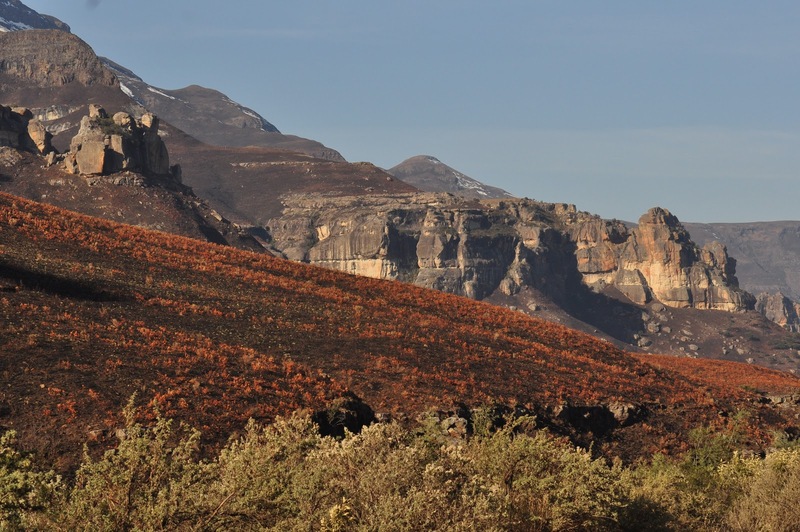 Views at the bottom of the Sani Pass road, South Africa. There are further accommodation and food options in the nearby town, Himevelle. We've heard reports that the best after ski and food is at Himeville Arms. 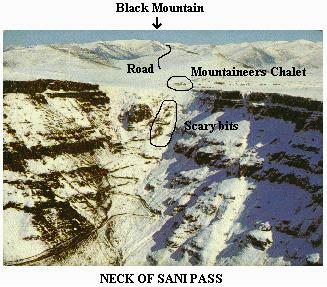 My goal was to ski in South Africa, and that's why the scary bits was the place to put on the skis. 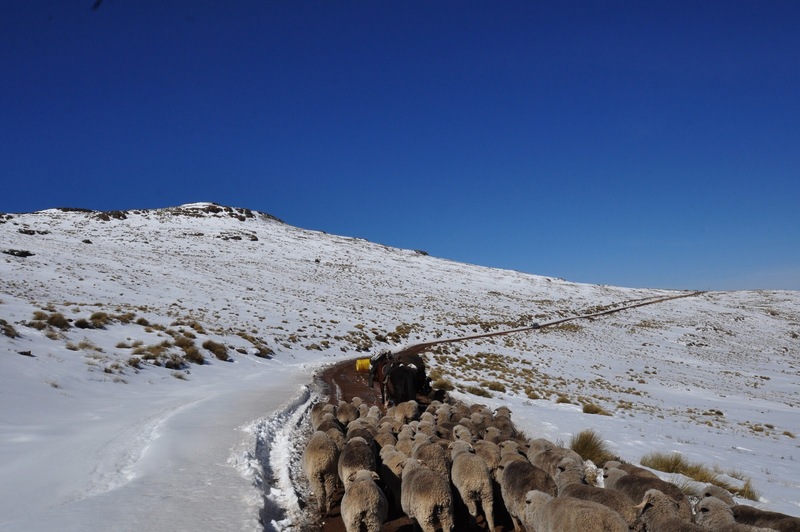 However, there is better skiing around the Sani Pass at the Black Mountain. 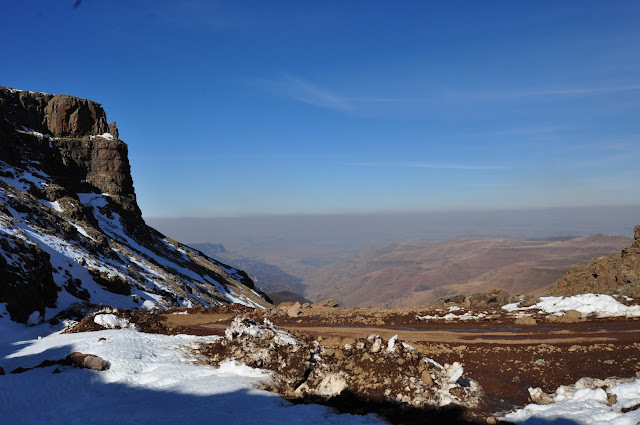 This is few kilometers from the top of Sani Pass towards Mohotlong, in the Lesotho side. We drove through this bowl-shaped area, and there was plenty of snow. You could easily hike up for some skiing. 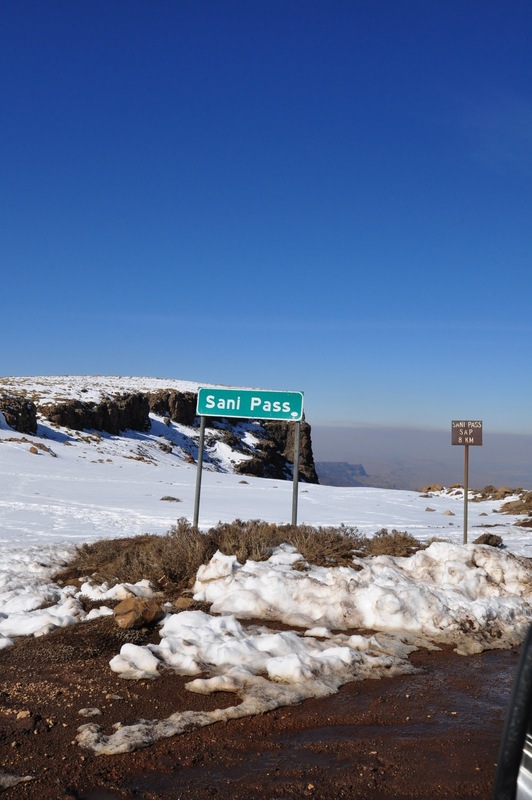 While Sani Pass appeared to be the only place with snow on the South Africa side, it is possible that there would have been snow on some other mountain areas. Access to Tiffendel would have required four wheel drive again, so never explored that direction, but it would have been interesting to find out if the closed ski area has snow, or if they were running entirely on man-made snow. 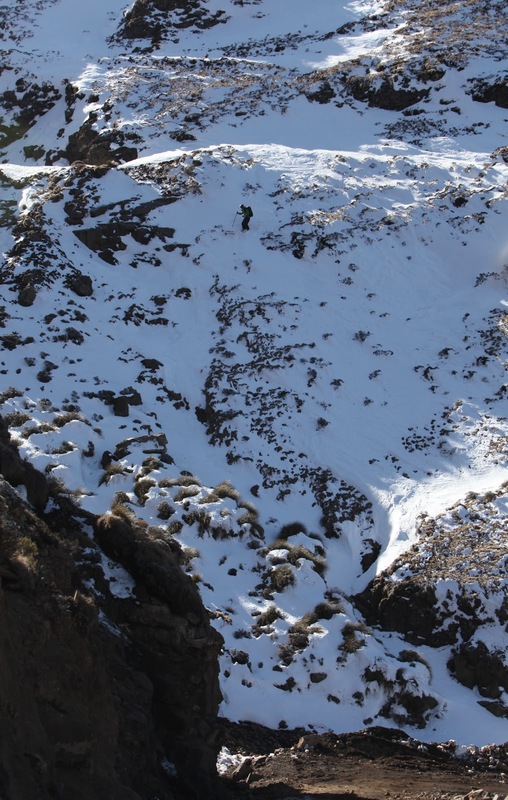 The dry climate makes it likely that even cold and high places can be without snow. Interestingly, later on our trip big parts of South Africa got a snow cover for a short duration due to a freak weather occurrence. 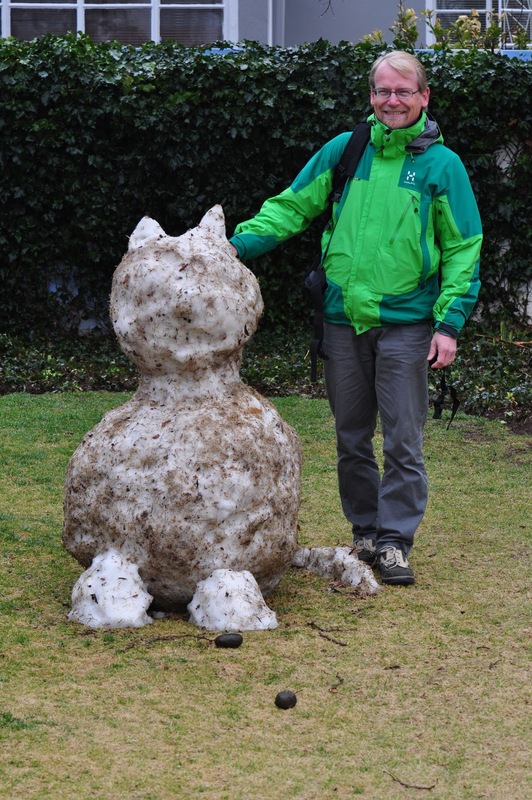 The owners of a hotel we stayed at near Johannesburg had constructed a snow man (or a cat, really) on their lawn. These countries are in four different continents, and a 110 000 kilometer trip for all of this. If I take the last 12 months as the season then our last year's round the world trip through Chile and New Zealand is also included. That is 6 continents in 12 months. Skiing in 25 different countries. A 156 000 kilometer trip. Four times around the world.